Today, Campaign for Accountability (“CfA”) asked the Office of Congressional Ethics (“OCE”) to investigate whether Rep. Rodney Frelinghuysen (R-NJ), chair of the House Appropriations Committee, violated House ethics rules when he warned a banking executive that a member of an activist group opposing the congressman worked at Lakeland Bank in New Jersey. WNYC reported that in March, Rep. Frelinghuysen, sent a fundraising appeal to bank board member Joseph O’Dowd, warning him that Senior Vice President and Assistant General Counsel Saily Avelenda participated in an activist group that opposed him. 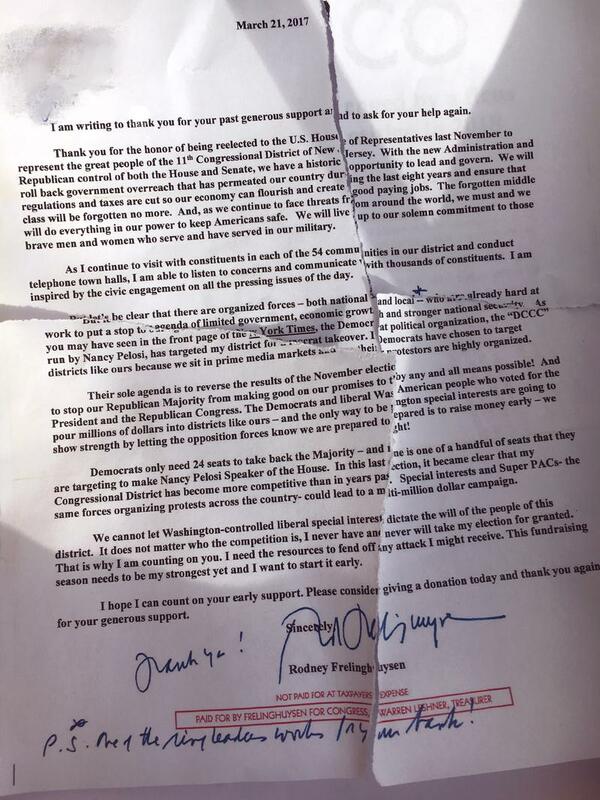 The letter from Frelinghuysen’s campaign committee explained that contributions were needed because “there are organized forces – both national and local – who are already hard at work to put a stop to an agenda of limited government, economic growth, stronger national security.” A handwritten asterisk appeared over the word local and at the bottom of the letter, a handwritten note, in the same ink and matching the congressman’s signature, read “P.S. One of the ringleaders works in your bank!” A copy of a news article quoting Ms. Avelenda was attached to the letter. Ms. Avelenda is a member of NJ11th for Change, which has been pressuring Frelinghuysen to meet with constituents and oppose President Trump’s agenda. Ms. Avelenda’s supervisor confronted her with the letter and required her to provide a written explanation to the bank’s CEO about her activities and to declare herself a friend of the bank. Ms. Avelenda stated, “I thought my congressman put them in a situation, and put me in a really bad situation as the constituent, and used his name, used his position, and used his stationary to try to punish me.” She is no longer employed by the bank. Lakeland Bank’s Code of Ethics specifically encourages employees to engage in political activities demonstrating that the bank reprimanded Ms. Avelenda to placate the congressman. CfA’s complaint asks OCE to investigate whether the congressman engaged in tortious interference with Ms. Avelenda’s business relations, whether he misused his office for the prospect of political gain, and whether he violated the rule requiring members to act in a manner that reflects creditably on the House.